He falsely claimed that he 'softened' Obama's policy on family separations. President Donald Trump mangled the facts Thursday when addressing immigration and falsely claiming - more than once - that former President Barack Obama was responsible for family separations at the border. Trump was widely criticized this spring for his rollout of a "zero-tolerance" policy on immigration that resulted in the chaotic separations of some 2,600 children from their families. According to the Department of Health and Human Services, there are still some 221 children in custody as a result of the policy, after a federal judge ordered that the families be reunited. Trump eventually signed an executive order backtracking on the policy, but he still seems frustrated that he was blamed for the chaos at the border. Initially, Trump blamed Democrats in Congress, although they don't have majority control to push through new immigration laws. And on Thursday, Trump blamed Obama, who never enforced a zero-tolerance policy that has led to the recent mass separation of families. "Nobody talks about that, but under President Obama, they separated children from the parents," Trump said. 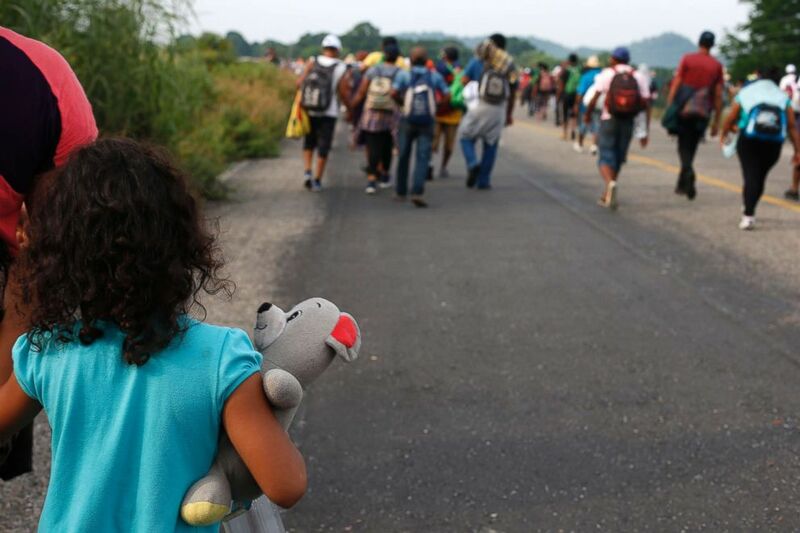 (Rebecca Blackwell/AP) A girl carries a stuffed teddy bear as she walks with her mother with a migrant caravan near Arriaga, Chiapas state, Mexico, Oct. 27, 2018. "President Obama separated children from families, and all I did was take the same law, and then I softened the law, but by softening the law, many people come up that would not have come up if there was separation," he said. Trump and Attorney General Jeff Sessions have derided the Obama-era policy as "catch and release" because there were numerous cases where the migrant wouldn't appear in court. They have previously said releasing families into the U.S. increased levels of illegal immigration in the U.S., which led to the zero-tolerance policy in the first place. That catch-and-release policy actually pre-dated Obama.